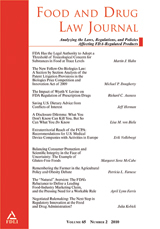 On January 21, 2011, Northeastern University Law Journal sponsored its third annual symposium. This year, it was entitled “From Seed to Stomach,” and addressed legal and regulatory aspects of obesity and food safety. The symposium was recorded for broadcast by CSPAN, which aired the material from February 25-28, 2011. 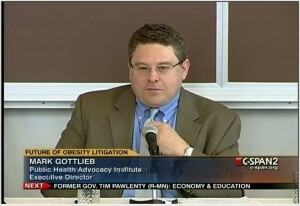 PHAI’s Executive Director, Mark Gottlieb, along with Stephen Gardner (Director of Litigation for the Center for Science in the Public Interest) appeared on a panel moderated by Stuart Rossman (Director of Litigation for the National Consumer Law Center) focused on the future of obesity litigaiton. The 80 minute panel is archived on CSPAN’s website. Topics addressed included the “cheeseburger bills,” the role of and use of arguments around choice and individual responsibility, consumer protection law, and the litigation against McDonald’s use of toy giveaways to sell Happy Meals. Research upon which Mr. Gottlieb’s presentation was based was supported in part by the Robert Wood Johnson Foundation’s Healthy Eating Research Program (#66968) and by the National Institutes of Health (grant RO1 CA 87571).